We have recently purchased a hearing assistance system which consists of receivers with headphones to be used during the service. Please ask our A/V Tech, Giorgia, if you would like some help with this. ﻿April is Earth Month, and the April Special Collection will be for the local chapter of Citizens' Climate Lobby. 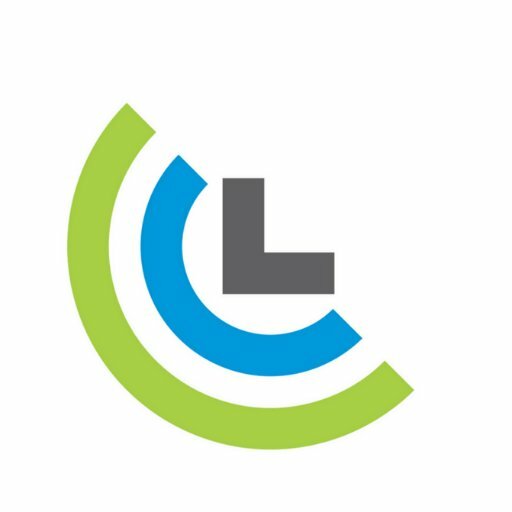 CCL is a nonpartisan, grassroots advocacy organization empowering people to experience breakthroughs exercising their personal and political power. The La Crosse chapter is headed by Larry Sleznikow, who took the lead in designing our Fellowship's new website. 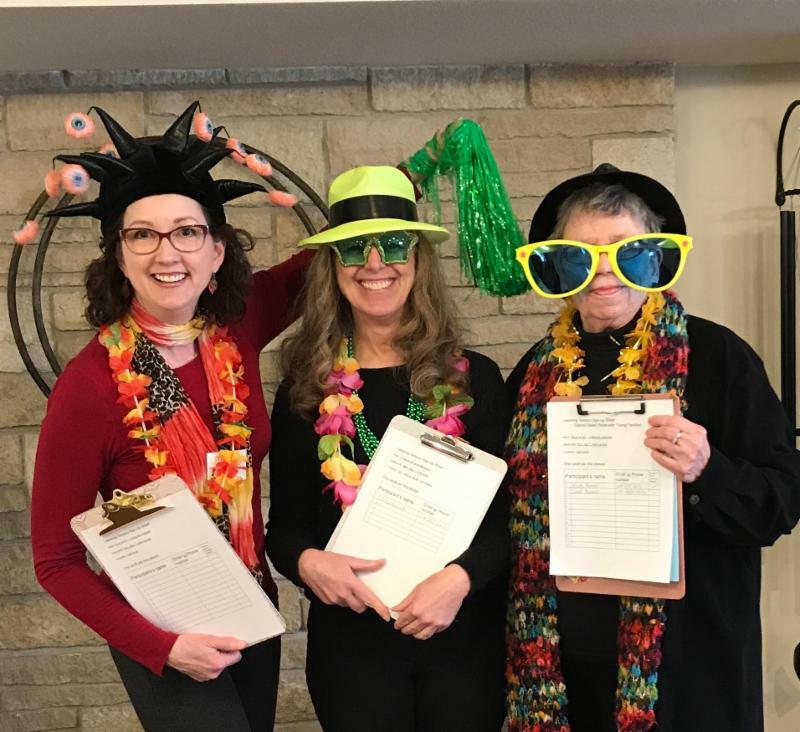 Please make checks payable to "La Crosse Citizens Climate Lobby" Contributions are not tax-deductible. YOUR VOICE MATTERS! Share your hopes and dreams for the future of our fellowship. This Sunday is the listening session especially for new members and friends. To sign up contact Cindy Ericksen at cindyericksen@gmail.com . You may also sign up for future listening sessions after service. These dates include: April 19, April 23, April 27, May 1, May 10 and May 18. More info on the Visioning Listening Sessions Facebook event page. Your voice matters! New members and friends are encouraged to attend this session after service. Pizza and childcare will be provided. 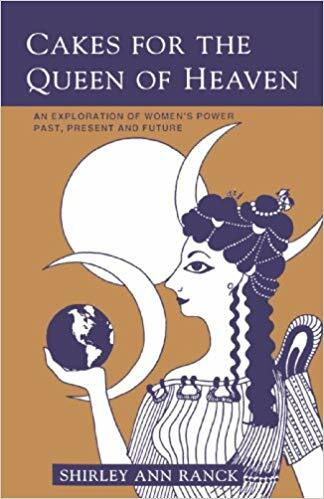 The classic UU women’s study course, “ Cakes for the Queen of Heaven ,” will be offered this April and May at UU La Crosse. The themes of the Session Plans are “The Sacred Female,” “In the Name of the Mother and the Daughter,” “Womanpower,” “The First Turning -- From Goddess to God,” and “Reclaiming Women's Heritage of Peace." Come join from 6:30 to 8:30 p.m. on Thursday April 18th and May 2nd, 16th and 30th. 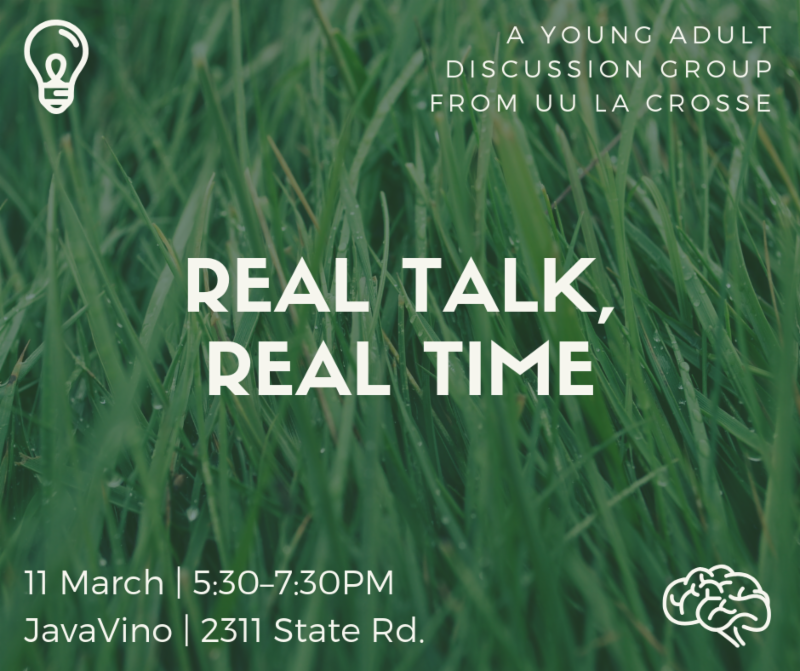 Sign up on the sheets can be found in the Fellowship coffee area or RSVP to Ingrid at iiverson@ulax.edu or Ellen at EllenQofSheba@gmail.com . We will formally welcome all who have become members of the congregation in the last year during the service. Interested in becoming a member of our Fellowship? Please contact Membership Development Co-Coordinators Donna Bauer & Jennifer Miller at jen@uulacrosse.org or reach Jen by phone at 779-861-2655. 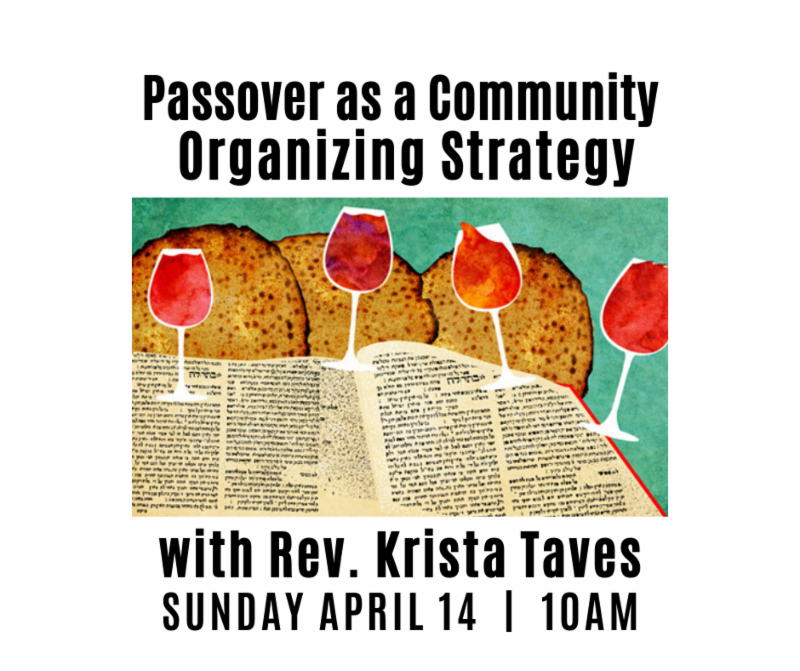 Due to the popularity of Pathways 1, which is an introduction to Unitarian Universalist history and theology, Rev. 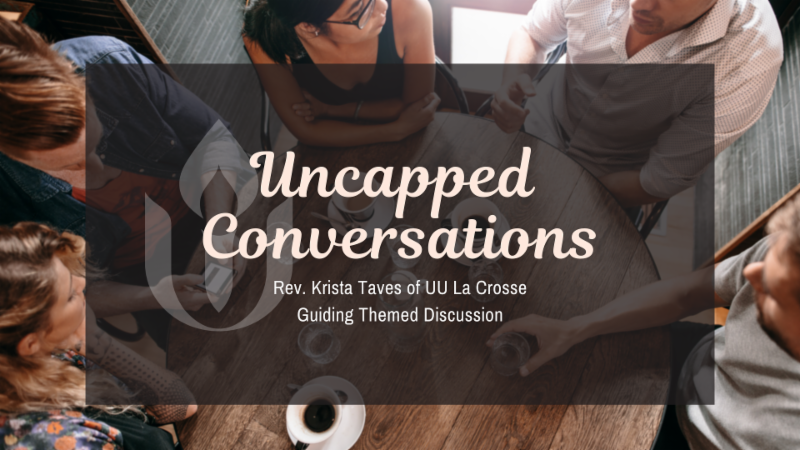 Taves is offering a Part 2 which will focus on contemporary Unitarian Universalist theology. All are welcome to attend whether you participated in Pathways 1 or not. Childcare is available if needed. Additionally, contact Rev. Krista at revkristataves@gmail.com to receive the reading materials. Sunday, April 28, 10am – "Respecting the Web of Life in the Driftless Area"
A meditation on the UU 7th principle: respect for the interdependent web of all existence.